Clean-air energy sources help minimize greenhouse gases and pollutants since they produce electricity that would have come from burning fossil fuels. The clean-air source that produces the most electricity is nuclear energy with 20% of the US total electricity, followed by hydroelectric power with 7%, and renewable energy with 3%. Since 1993, one-third of voluntary carbon dioxide reductions from US industries results from the increased nuclear capacity and improved efficiency in nuclear power plants. In 2008, nuclear energy accounted for approximately 72% of the US' emission-free generation. The total greenhouse gas emissions in the United States increased from 6,421.8 million metric tons of carbon dioxide in 1990 to 7,179.7 million metric tons in 2007. In the US, electricity that is nuclear-generated avoids approximately one million tons of nitrogen oxide and nearly three million tons of sulfur dioxide per year. It also avoids about 700 million metric tons of carbon dioxide per year. The volume of the prevented carbon dioxide is equivalent to taking 98% of all passenger cars off the US' roads. Throughout the world, nuclear energy avoids the emissions of more than 2.6 billion metric tons of carbon dioxide per year. The principle greenhouse gas that concerns policy discussions is carbon dioxide. As seen in the chart, nuclear energy emits 17 tons of carbon dioxide which is equivalent to one gigawatt hour. This shows that nuclear energy is very clean in the sense that it does not emit significant amounts of carbon dioxide. Start up cost: One of the highest of any plant. -Start up cost per Megawatt hour may be less than that of other alternatives. Even if we don’t want to use it long term (meaning 100’s of years), it may still be a good alternative until we find a new way. -Malcolm Grimston (December 2005) (PDF). The Importance of Politics to Nuclear New Build. Royal Institute of International Affairs. pp. 34. http://www.chathamhouse.org.uk/pdf/research/sdp/Dec05nuclear.pdf#page=34. Retrieved 2006-11-17. Used nuclear fuel is in solid form. A typical 1,000 megawatt nuclear power plant generates enough electricity for approximately 740,000 homes – the makes about 20 metric tons of used fuel per year. The US has 104 commercial nuclear reactors and altogether they generate approximately 2,000 metric tons of used fuel per year. The used fuel is stored at the plant sites in either fuel pools or basins, which are enclosed, steel-lined vaults filled with water, or in reinforced steel or concrete containers. Because the place at Yucca Mountain where the used fuel is going to be contained has been delayed in construction, (not set to be completed before 2020) nuclear power plants have been forced to store more used fuel for a longer length of time than originally thought. 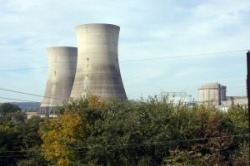 This means that many nuclear power plants are running out of storage space for their used fuel. As a result, the plant's choices are to either expand the pool capacity or turn to container storage. The first choice is to expand the pool capacity. This is accomplished by “re-racking” the containers, or shifting them so they are closer together. But, this strategy has its limitations as well because the plant can only re-rack the pool for so long before there isn't enough room for more containers and the plant can not build another pool. It would be expensive and it usually would not fit in the layout of the existing plant. Approximately one-half of the US nuclear power plants store used fuel in large containers made of steel or steel-reinforced concrete. This is known as dry storage. The containers are loaded with an inert, or inactive, gas that is sealed and stored in reinforced concrete pads or in concrete bunkers. These containers are licensed to withstand 20 years. After 20 years, they are inspected and the license can be extended for another 20-40 years. There is an initial cost of $10-20 million and once the facility is complete it takes another $5-7 million to maintain it. Used nuclear fuel is transported from the nuclear power plants to storage, recycling, and disposal facilities by rail, truck, or barge. During the past 40 years, there have been more than 3,000 shipments of used fuel safely transported in the US. Outside the US, there have been tens of thousands of safely shipped used nuclear fuel. Even though the vehicles transporting the used fuel have had accidents, there has not been radioactive material released from the containers. It is projected that when the repository is opened at Yucca Mountain, there will be about 175 used fuel shipments per year which would equal 300 to 500 containers. Studies of Yucca Mountain show that nuclear can be safely stored there for thousands of years until the radioactive decay is complete, making the used fuel non-hazardous. The US has an “open” fuel cycle where after the fuel goes through the reactor once, it is then disposed. France, Japan, and the United Kingdom have a “closed” fuel cycle where the used reactor fuel is reprocessed to recover the plutonium. The plutonium is then recycled into new fuel for the already existing reactors. The remaining byproducts will still have to be disposed. Reprocessing technology is known as PUREX. It makes it possible to recycle and reuse the uranium and plutonium from used nuclear fuel. The remaining waste products are mainly unusable products. They are mixed with glass for disposal as high-level waste in a process known as vitrification. This is what France and the United Kingdom have. It does, though, produce toxic waste which takes thousands of years to decay to a safe radioactive levels. If there was a meltdown of a reactor close to lake Michigan, a massive portion of our fresh water would be ruined. This means that it is expensive to dispose and protect waste, to prevent meltdowns and to be prepared for them. But, a properly functioning nuclear power plant actually puts less radioactivity into the air than a coal fired power plant, and it doesn't affect the surrounding area outside of nuclear waste. 1954 first nuclear power plant.